An important note to all SDM customers…. Every SDM telescope is a handcrafted original with 300 – 400 hours of skilled craftsmanship lavished upon each creation. Delivery dates are best estimates but I will not rush the delivery of your SDM. Your scope is as important to me as it is to you. 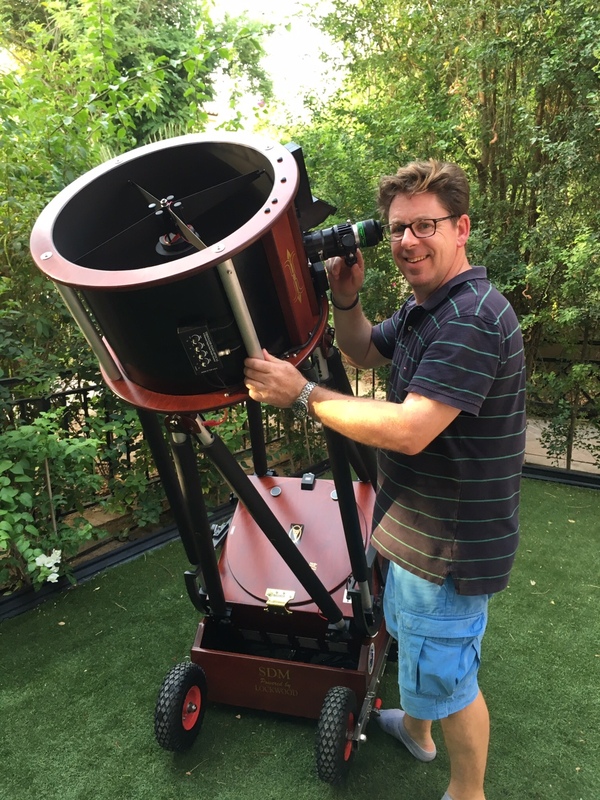 Your SDM is fully field tested so that I can be completely satisfied you are receiving your ultimate dream telescope that will reward you with unparalleled viewing pleasure and the “WOW” factor. Every SDM telescope carries with it my personal seal of approval and an enormous amount of kudos. Australia just had its BIGGEST star party yet! 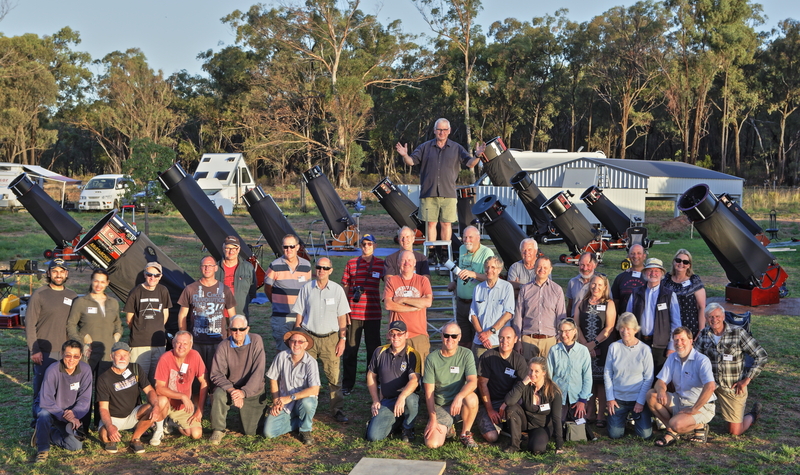 Not in quantity of numbers, but aperture 🙂 An exclusive group of owners of SDM Telescopes gathered under the same dark sky as our professional observatories in line of sight to the Siding Spring Observatory. 18 monster dobs from numerous states travelled hundreds of kilometres to gather under pristine sky, and what memorable views they produced. Hopefully this will be the first gathering of many – the views of the Tarantula Nebula through host Allan Wades 32″ will never be bettered! Photo credits go to Mike Lockwood, that very fine maker of large mirrors who travelled from the States to check out the Southern Skies. Blue Scope makes Stephen VERY Happy! 28″ f/3.3 SDM#062 with Mike Lockwood optics. I had been waiting for a long time when Kororia finally arrived in New Zealand. After paying Customs and GST I was told that they could not guarantee delivery until Monday, 27th March but Pete was arriving on Saturday 25th. So I decided to drive the 700km return journey myself and bring Kororia back on a trailer. The men loaded the huge box (2.4 x 1.2 x 1.2m and weighing around 600kg) onto the trailer then I made my way very carefully homewards. Some of our Northland roads are pretty windy and I didn’t want the precious contents strewn over the road. So it was a slow trip home. I had frequent stops to left other drivers past. Pete and his 90 year old Uncle Merv arrived on the morning of Saturday 25th. The big box was waiting on the trailer up at my observatory, Pukemaru Observatory. The observatory is 4.8m wide, 7.2m long with a slide-off roof that comes 2/3 of the way off. I also have fold-down walls on three sides. Peter designed my telescope so it could see over the walls when they were folded down. In fact I can get down to within 7° of the horizon with half of the mirror (half of 28” is 14” and that’s still pretty good) although I tend not to look so low. Following a long, hot and humid summer in the UAE, the sudden drop in temperature marks the start of the outdoor season and a chance to wheel out Zeùs under dark skies again. Our dark sky location is situated approx. 80km east of Dubai, towards the Omani border near the small hillside village of Shawka. Amongst the craggy rock landscape, I set up in a public car park 421m above sea level. 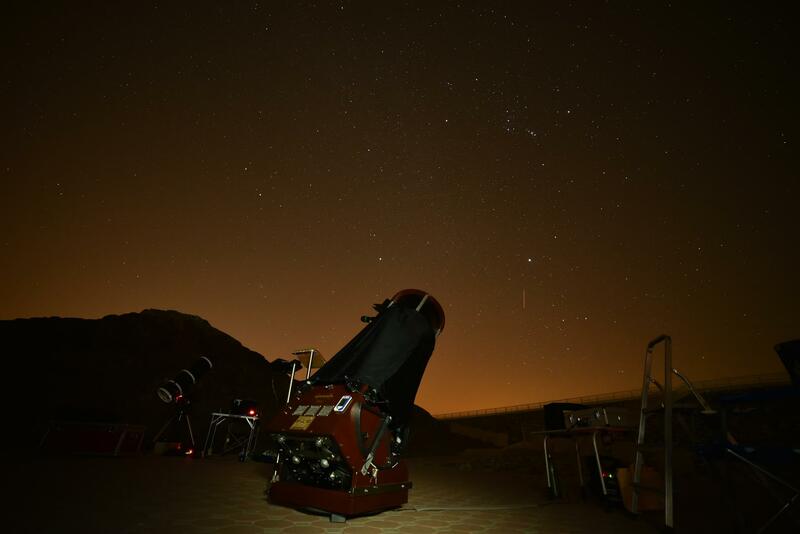 The overall seeing was good with above average transparency despite the Dubai sky glow to the western horizon. The eastern and southern sky was the main target area for the night. Whilst eagerly awaiting Orion to r ise over the hill range, I spent time in Auriga taking in the fantastic views of its open clusters with M37 stealing the show. The depth, structure and colour on offer was truly remarkable. A short slew over to M35 which was made better by the compact open cluster NGC 2158 bombing the view in the background. In a land where only the finest is good enough and in a city where stands the tallest building in the world, it seems only fitting that the magnificent SDM#099 had found its home. This outstanding 18? f/4 is finished to the highest standard with every conceivable extra to ensure that the exquisite optic from Mike Lockwood performs to its best. It’s wearing the ultimate in technology too, with ServoCat, 32k encoders and the very latest astronomical brain – the Nexus DSC. Read the full report when you visit Zeus. Stephen on Blue Scope makes Stephen VERY Happy! Stefan Zietara on Blue Scope makes Stephen VERY Happy!